This post is in partnership with P&G. Regardless, all opinions are honest and my own. Before we get into today’s post and corresponding awesome deal, I want to acknowledge that I work from home in my PJs most days without any coworkers to see my smile. I also want to tell you all that if you’ve ever been judged by your looks alone, I’m not with it. You’re so much more than your teeth, smile or any other outward appearance. But alas, people do judge. If you have less-than-sparkling teeth, people may judge your personal hygiene—even if hygiene is not the reason for discoloration. These judgements can affect many areas of your life, including your career. Studies show that people with beautiful smiles appear more intelligent, successful and wealthy to Americans. I don’t know that I need my employer or clients to think I’m wealthy, but I do want them to think I’m intelligent and successful at what I put my mind to. That’s why I’m super obsessive about my oral health routine. I have been since I was a child, primarily because I didn’t want cavities. Now that I’m older I’m also concerned about gingivitis, and conscious that yellowing teeth may illicit negative judgements from others—especially others at work. whitens my teeth by removing up to 80% of surface stains. protects my teeth against future stains. strengthens my teeth while remaining safe on the enamel. protects against cavities and gingivitis. 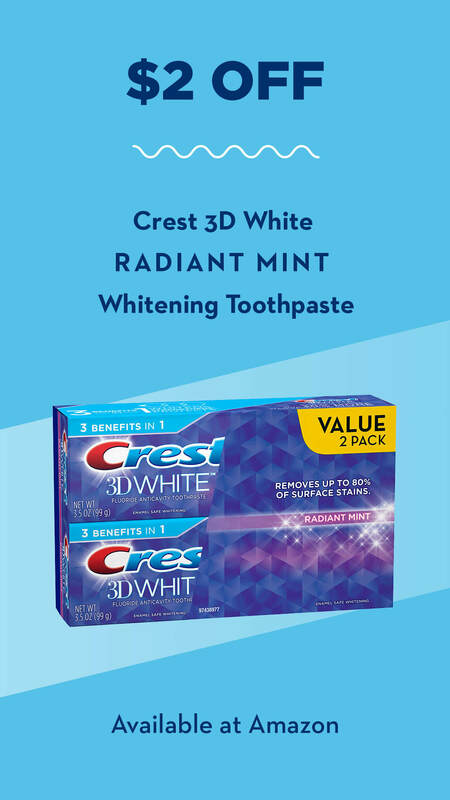 Right now, you can get a 2-pack of Crest 3D White Radiant Mint Whitening toothpaste for $2.00 off on Amazon as an add on item. Whether you’re doing it for your health, your self-confidence or your career, hop on this deal quick. This entry was posted in Ways to Save Money on December 17, 2017 by femmefrugality.